Do you like Anna and Elsa DJ's? Share it with your friends. 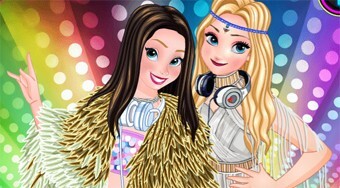 Anna and Elsa DJ's is a wonderful girl game where the couple of fairy-tales Anna and Elsa decided to play a musical career and become the best DJs in the world. Choose both girls' upcoming clothes for their first show at the club and eventually help them choose the music for their performance.